At the New York City headquarters of International Flavors and Fragrances (IFF), master perfumers experiment with novel smell combinations in the largest fine fragrance perfumery lab in the world. IFF invests heavily in research, spending about $185 million annually to develop new smells for products like deodorants, shampoos and perfumes, and to create fresh flavors for snacks, packaged meals and drinks. To develop a new scent, perfumers combine dozens of oils, each with a distinct smell characteristic, to create a blend that they hope will exceed the sum of its parts. 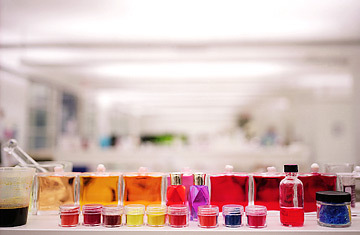 IFF has 5,300 employees and produces more than 31,000 compounds, about 60% of which are flavors and 40% fragrances.